You need to follow the procedure below to make a registration for your presentation. Access to following URL and select the language for this site. 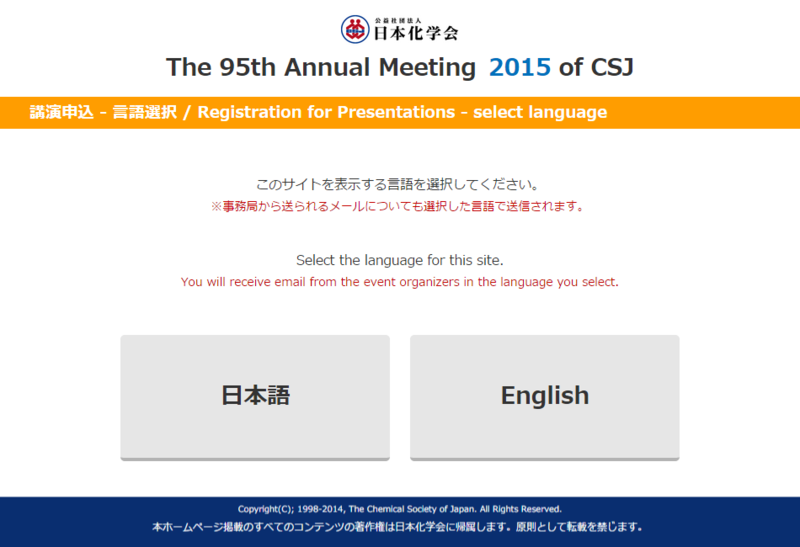 You will receive email from the event organizers in the language you select. Click "Send" after you have entered your email address. 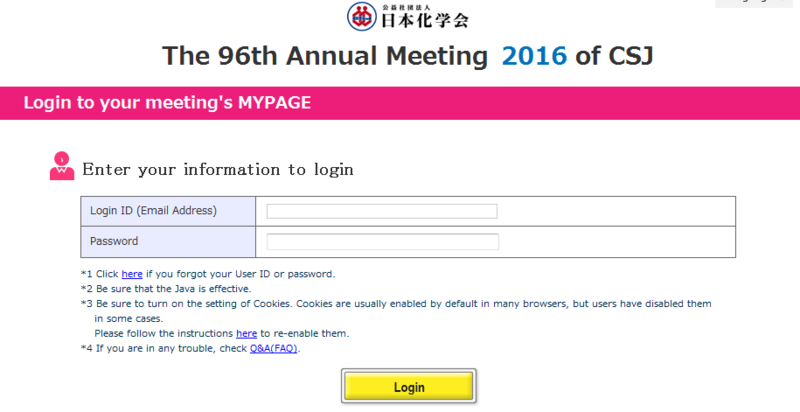 You will use your address after registration to login to your meeting's MYPAGE. emails from the event organization will be sent to your address also. 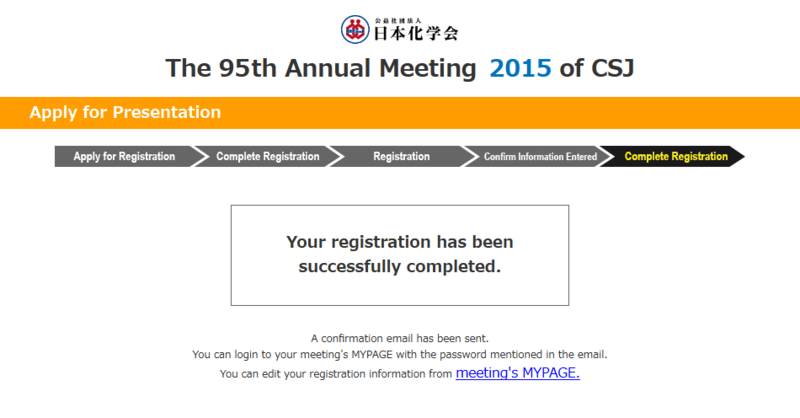 You will receive an email including the URL for registration. Check the email you received. *1) There are few possible things if you can not receive our email. *2) The information presented here will expire 24 hours after the initial request was made. 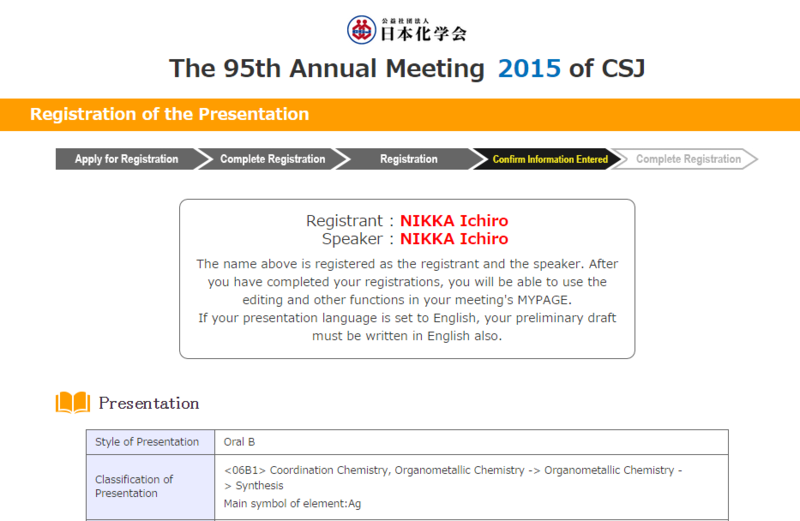 There are two ways to register your presentation's information. (A) Enter the information directly. (B) Use the summary in text file you have already created. Choose from Oral A Presentation, Oral B Presentation, or ATP Poster. Choose "Classification of Presentation." 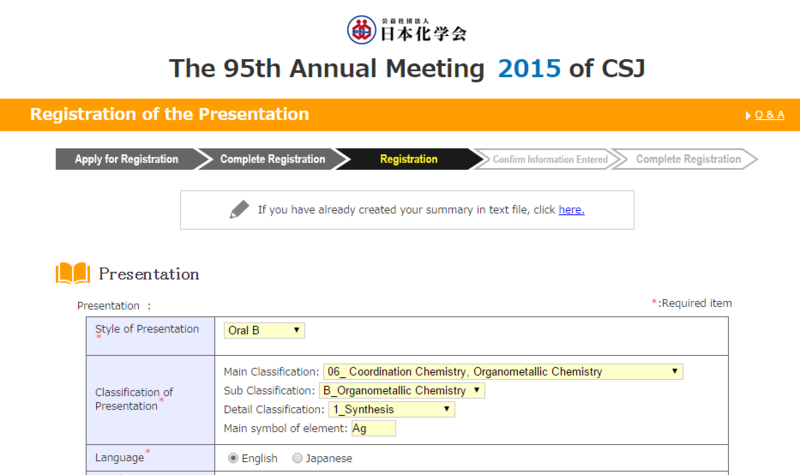 Click here to check the list of classification of presentation. You need to enter the main symbol of element if you chose 6.Coordination Chemistry, Organometallic Chemistry or 8E.Organic Chemistry -Reaction and Synthesis-Organometallic Compounds. Choose either Japanese or English. *Use substitute characters if you need to enter superscript or unit symbol. Click here for detail. Enter simple and easy to understand outline of your presentation in English (100 words, 800 characters, or less.) Do not use IUPAC name for a compound of complicated structures. Try using general terms and simple expressions so that the people outside the field can also understand. *1) If you are enter more than one institution, click "Add more research institution." Don't enter more than one institution in one column. *2) The order mentioned in the program will be in the order you entered. *Keywords you entered will be use as a search key in WEB program. Click here for detail. You can choose your inconvenient date, due to the graduation ceremony. Please note that even if you enter a date, it does not guarantee that date will be passed over. Select “yes” if you would like to give consecutive presentations, then enter the ordinal relation and title of the presentations. Your application for consecutive presentations has not been completed yet. After completing this application, apply for consecutive presentations. Click here for details. Enter the title of presentation before and after. Enter your notes in 300 characters or less. Ｎo application can be made only by a student. Enter the name of the collaborator if needed. Click here for detail. *1) The order mentioned in the program will be in the order you entered. *2) -Click here to check how to enter special characters. We will check your information if you enter a ME No. though you are the registrant or the speaker. It is prohibited to use one number with the other members of the laboratory. Register your own member No.. Click here for detail. Enter the name of institution and your status. Choose the speaker of your presentation from the authors. Mark check if you wish to nominate. 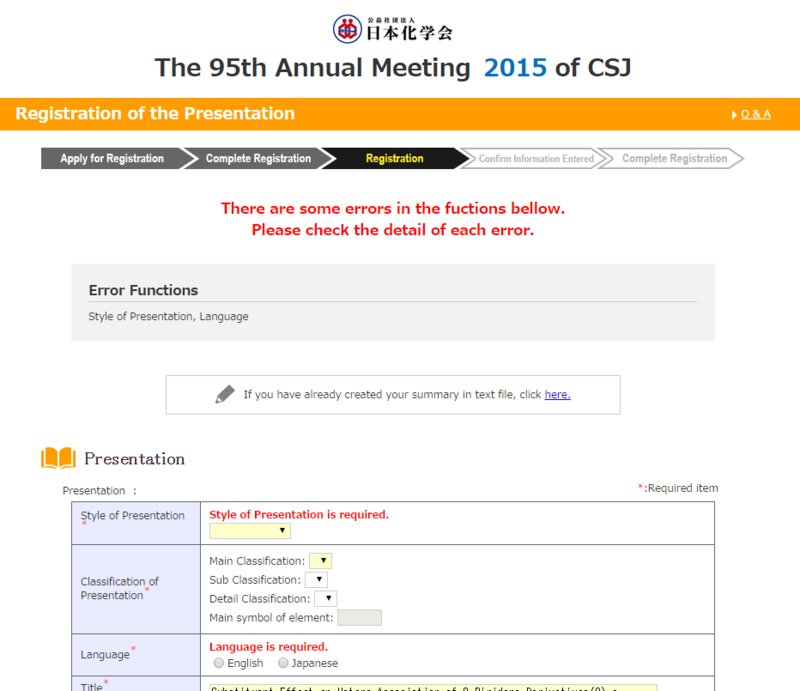 It will appear if you choose to nominate for CSJ Student Presentation Award. Choose the registrant of your presentation from the authors. Enter the name of department, and the name of registrant's institution. All the emails sent from event organization will be CC'd to these addresses. TO will be the email address used for registration. If you are a student and need to share information with your professor, enter professor's email address in CC. Click here for detail. *We will not send any documents overseas. Choose either "Home" or "Office." You don't have to enter presentation information directly if you have already created your summary in text file. You can reflect the data from the link "If you have already created your summary in text file, click here." Open your text file, copy all and paste it the text area in the pop-up screen, then click "Reflect your information." The information of your presentation will reflect in the page. Click "Confirm Information Entered" if there is no more information to add. An error message will appear at the top of the page. Check and edit each function and click "Confirm." You will receive an email titled "Application Completed." Check the information below included in that mail. 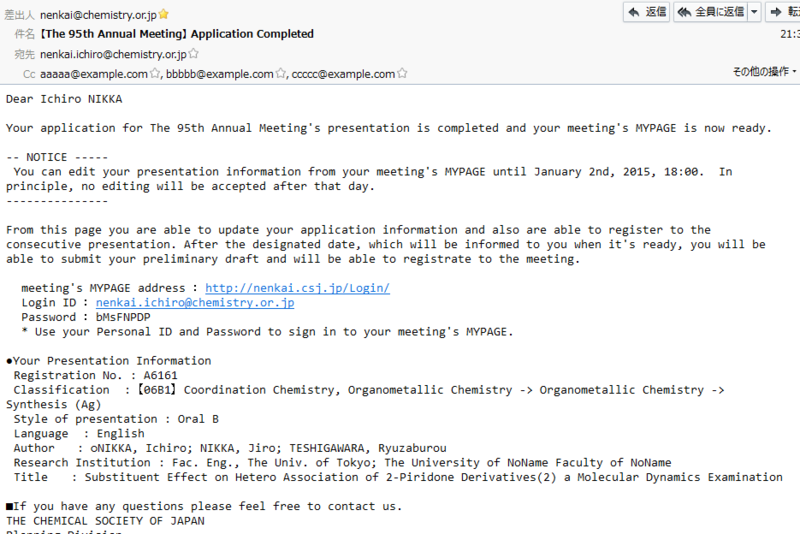 Confirm and edit your presentation information. 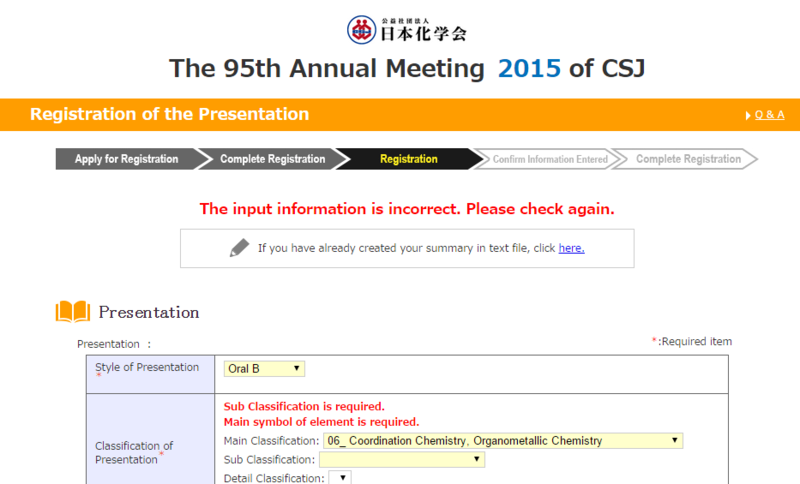 You need to follow the procedure below to confirm and edit your presentation information. To login you need the login ID (your email address) and your password. You can confirm the detail information of your presentation by clicking "Confirm / Edit Detail" in the top page of meeting's MYPAGE. 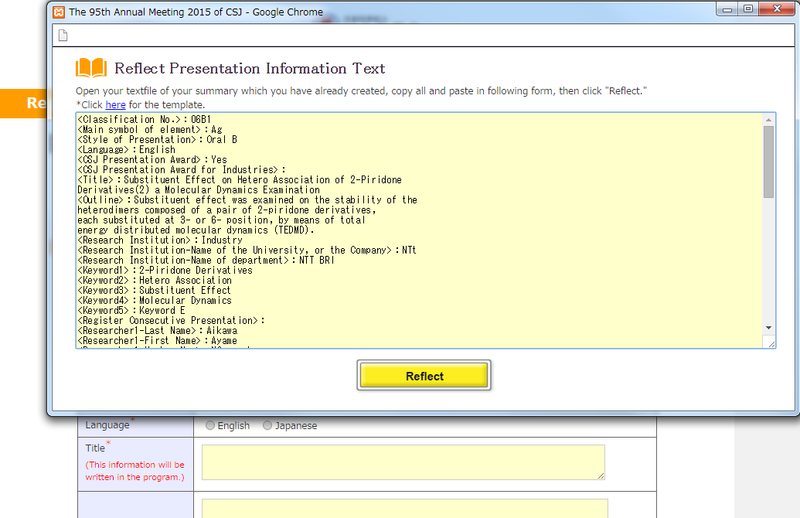 The page to edit the information of your presentation will appear by clicking "Edit" at the bottom of the page. Click "Confirm Information Entered" after editing the information and click "Register" if there is no error. Edition of your presentation's information has completed.